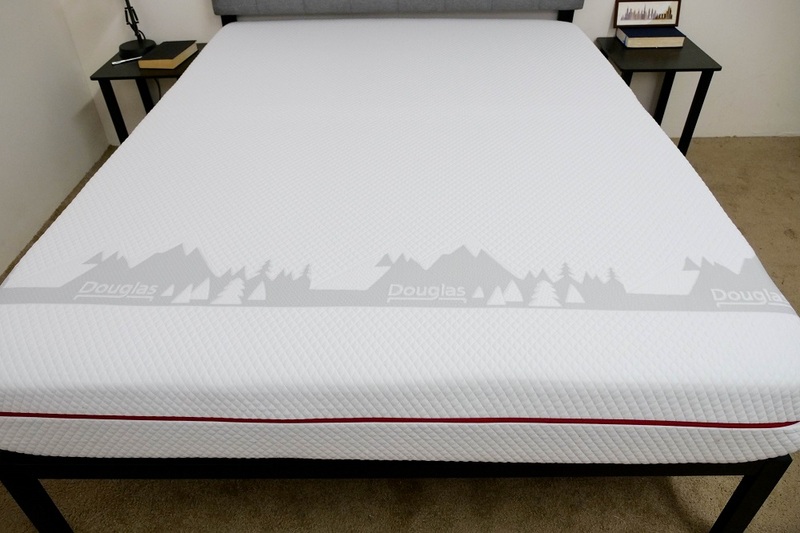 Douglas Mattress Review - Is This the Canadian Bed for You? We have affiliate relationships where we are paid a commission on sales through some of our links. Also, Casper provided financial support to allow our company to acquire Sleepopolis. See our disclosures. Do You Need a Boxspring? 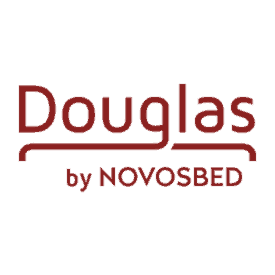 Billing itself as the “most Canadian mattress in Canada,” the Douglas mattress from Novosbed is built with Canadian-sourced materials in factories throughout Ontario and Quebec. Featuring an all-foam construction, this bed aims to bring both pressure relief and support to Canadian sleepers across the country. But just how comfortable is the Douglas? Today I’ll be taking it through a series of rigorous tests to figure out just that. And who knows—by the end of this review you might just find the mattress of your dreams! Continue reading below for my full review of the Douglas bed. Don’t have time to read it all? Click here to skip to the bottom and check out my review summary. 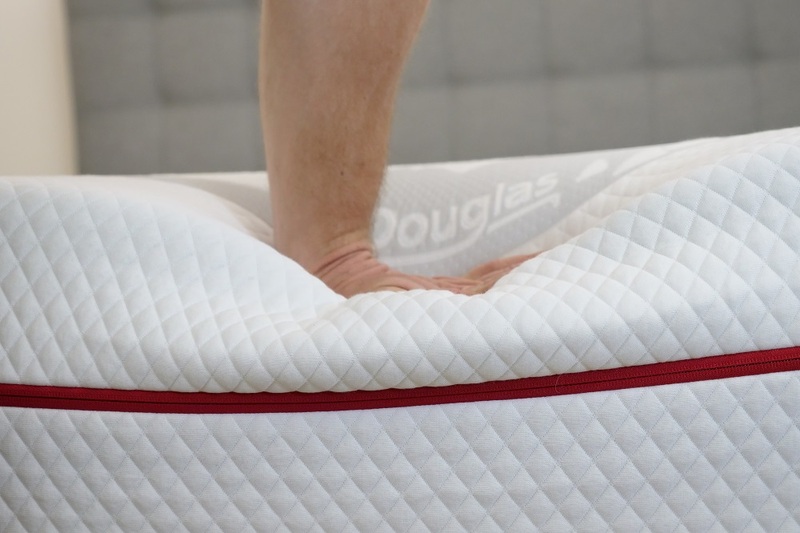 With its balanced, all-foam construction, the Canadian Douglas mattress will likely satisfy a wide range of sleepers. Save $50 off your purchase with our special discount! As I mentioned above, the Douglas is built entirely of foam, with its three layers stacking up to a total 10” of comfort. 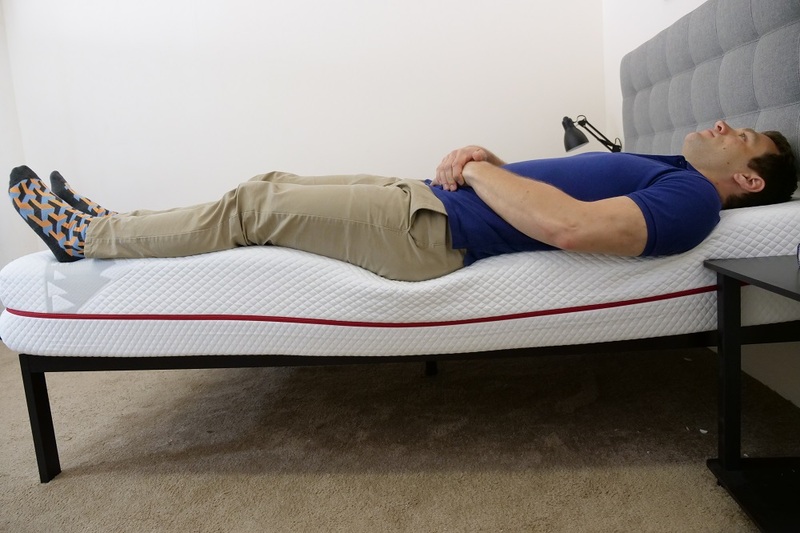 In addition to the pressure relief and support intended by the foam design, the bed is also outfitted with some special cooling features to ensure that even the most warm-blooded sleeper doesn’t overheat in the night. To see how this all comes together, let’s dive into these layers! Cover – Crafted from an eco-friendly Tencel blend, the cover is soft to the touch, breathable and moisture-wicking. It’s also totally removable, which means you’ll be able to take it off and wash it with the rest of your bedding. I should add that it also features a lovely mountain range design, meant to evoke the Canadian Rockies. 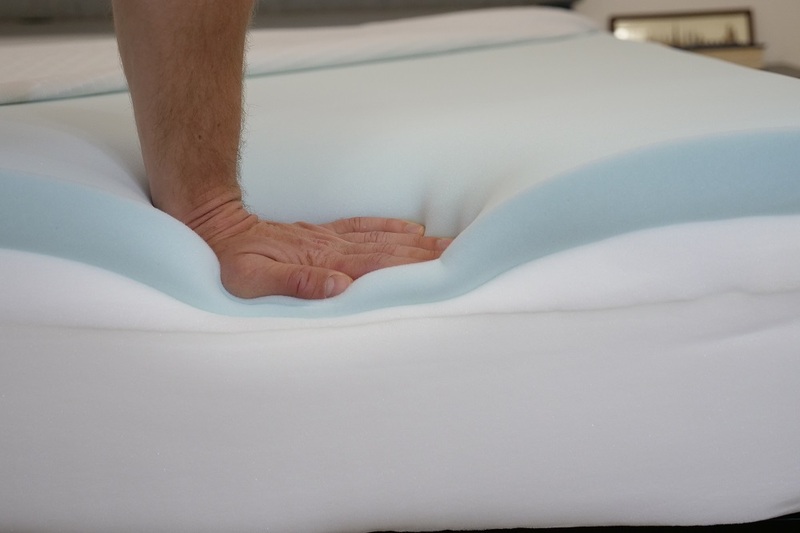 Comfort Layer – The comfort layer is built with 2” of gel memory foam. This material has a slow response to pressure and provides immediate relief to the sleeper. 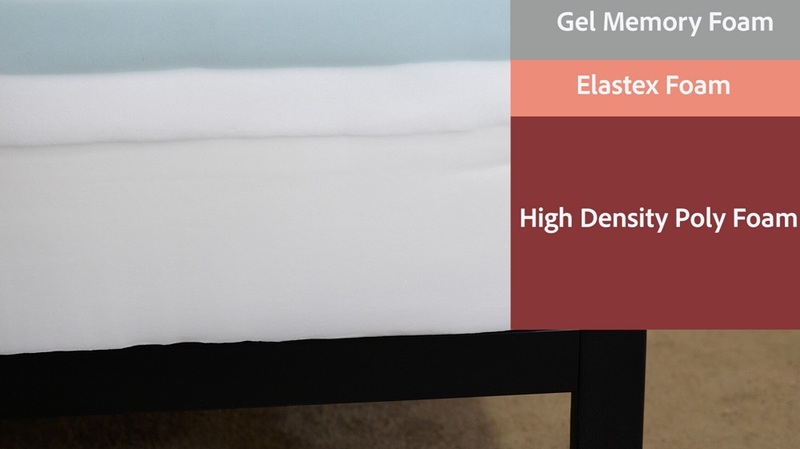 While memory foam has a bit of a reputation for overheating, the gel infusion helps to combat this for quality temperature regulation throughout the mattress. Transition Layer – Directly below the comfort layer you’ll find 2” of Elastex foam, which has a quicker response to pressure than the gel foam up top. This section is fairly bouncy, so will counteract some of the sinkage of the comfort layer and lift the sleeper up and out of the structure. This layer also works to transition the sleeper from the soft memory foam into the bed’s firm foundation. Foundation Layer – And finally the base of the bed, which is comprised of 6” of high-density poly foam. Intended to mimic the properties of micro-coils, this layer is specifically designed to isolate motion so you won’t be too bothered by your bed mate’s movements in the night. After taking a look at the construction of the Douglas, let’s chat about the firmness and feel. I started off by applying light hand pressure to the mattress and found that I was immediately interacting with the gentle gel memory foam in the top layer. The material contoured snuggly around my hand for some pleasant pressure relief. Pushing in further, I encountered the energetic Elastex foam, which lifted me out of the bed. At this point, I’d like to note that people of different body types and shapes are going to feel firmness differently, so I brought in three other testers to help me figure out the Douglas’ unique feel. We each took a turn lying on the mattress and shared our own personal firmness ratings, which I then compiled on the graph below. While feel is always going to be an individual thing, our responses should give you a pretty good sense of the firmness range you can expect from the mattress. 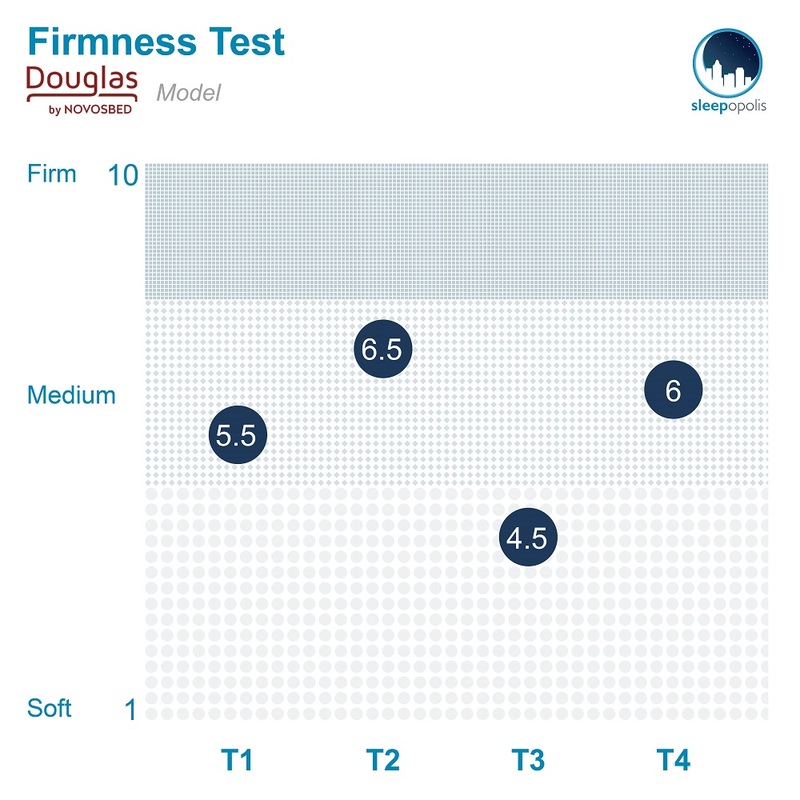 Though there was quite a bit of discrepancy among my testers, we landed on an average firmness rating of 5.6 for the Douglas. When compared to the industry standard of 6.5 for medium firmness, this bed appears to be a touch softer than medium firm. I personally gave the mattress a 5.5 as I found the combination of foams produced a soft, gentle feel. While the poly foam base does a good job of supporting the overall structure, you will experience some pleasant sinkage and contouring through the softer top layers. This will be great for a wide variety of sleepers, but especially those who doze primarily on their sides. Now that we’ve gotten firmness taken care of, let’s chat about pressure, arguably one of the most important components of any bed’s feel. And while I could tell you where you’re likely to feel pressure points form while lying on the Douglas, I thought I’d provide you with a visual representation instead. To do this, I placed a pressure map on top of the mattress and lied on my back, side, and stomach. You can see the results on the image below where pressure is represented from blue (low pressure) to red (high pressure). Back – Lying on my back, I felt as though my weight was pretty evenly distributed across the surface. I definitely felt myself sinking into the memory foam top layer, which provided some cushiony relief to my lower back. 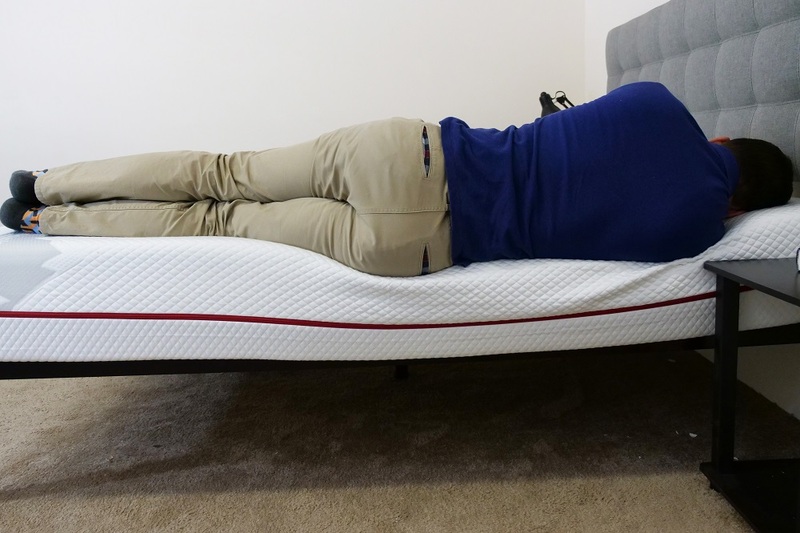 Given the comfort layer’s slow response to pressure, I would say that I did feel slightly stuck in the mattress, which made it somewhat difficult to change positions. Side – As you can see in the graphic above, I hardly felt any pressure points form at my shoulders and hips, typical problem areas for side sleepers. This isn’t that surprising given that the bed is just a touch below medium firm, which is a great level for those who doze primarily on their sides. Stomach – While strict side sleepers tend to like softer beds, stomach sleepers usually prefer firmer ones as they work to keep their hips and shoulders in an even spinal alignment. That being said, I did detect some pressure forming at my chest and hips while lying on this mattress. Sleep primarily on your side? Check out my top picks for side sleepers. 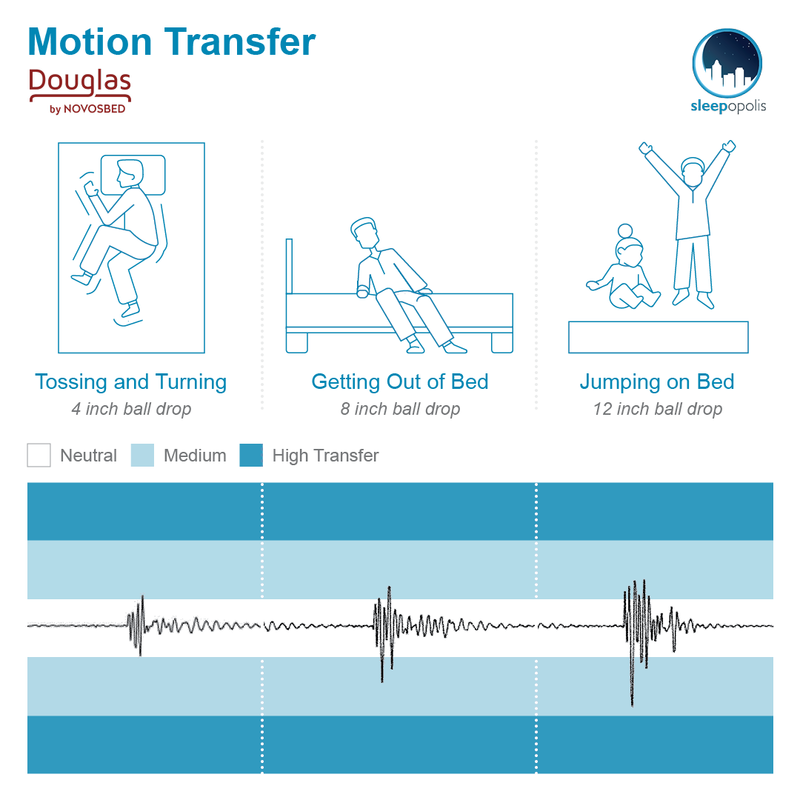 Next up, let’s take a look at the bed’s motion transfer, or the amount of disturbance you’re likely to experience from one side of the mattress to the other. This test will be especially important for those of you planning to share your bed with a partner as it’ll clue you into how bothered you’ll be by their movements in the middle of the night. To illustrate this motion transfer, I dropped a 10 lb. steel ball from heights of 4 inches, 8 inches and 12 inches and measured the disturbance it caused: the bigger the lines, the bigger the disturbance. In my opinion, these are really impressive motion transfer results. Not only does the memory foam do an excellent job of absorbing disturbance, but the foundational layer of poly foam further isolates this motion and dissipates it throughout the mattress. What this means is that you’re not likely to be too disturbed by your bed mate’s tosses and turns. Another thing you’ll likely want to know when buying a new bed is whether you’re going to feel like you’re sinking “into” the mattress or lying “on top” of it. To visualize this sinkage, I placed four balls of varying sizes and densities (a 6 lb medicine ball, a 10 lb steel ball, a 50 lb medicine ball, and a 100 lb medicine ball) on the mattress and measured how much they compressed the surface. The variations in size, weight and density are meant to simulate different body parts and different sized sleepers. 6 lb medicine ball: 1.5 inches of sinkage. 10 lb steel ball: 2.5 inches of sinkage. 50 lb medicine ball: 4.5 inches of sinkage. 100 lb medicine ball: 6 inches of sinkage. Compared with other all-foam mattresses I’ve reviewed, these results show slightly more sinkage, which tells me you’re likely to sink deeply into the Douglas. This is consistent with the other tests I’ve done thus far, which highlighted the bed’s deep contouring properties. I should note that for all this sinking, the Elastex foam in the transition layer does a pretty good job of supporting the sleeper to prevent that stuck-in-the-bed feeling. For more Canadian Bed Reviews, check out some of my favorites! And finally, let’s examine the Douglas’ edge support. This test will let you know how much of the bed’s surface area you’ll be able to use, which will be a crucial bit of information for you if you plan to share your mattress with a partner. Lying near the side of the Douglas, I felt as supported as I did in the center. Scooting closer to the edge, I began to experience some compression through the softer top layers. You’ll notice the deep contouring here, especially at the shoulders and hips. Even with all this sinkage, I didn’t feel as though I’d roll out of the bed. Rolling onto my side, I continued to feel pretty good support at the edge. The compression got slightly more severe in this position, which is to be expected with the higher concentration of weight at my shoulders and hips. While the contouring here is readily apparent, I still felt solid on my side. In this position, I wanted to simulate what it would feel like to be sitting on the bed in the morning when you’re lacing up your shoes and getting ready for the day. A lot of foam mattresses experience severe compression in this position, but the Douglas actually held up fairly well. Shipping: Free, arrives compressed in a box. Just getting started? Begin your mattress search with my mattress reviews breakdown. If you’re convinced the Douglas is the right mattress for you, the size and pricing information for the mattress are below. Be sure to click this link to save $50 on your Douglas Purchase! IS THE DOUGLAS MATTRESS RIGHT FOR YOU? 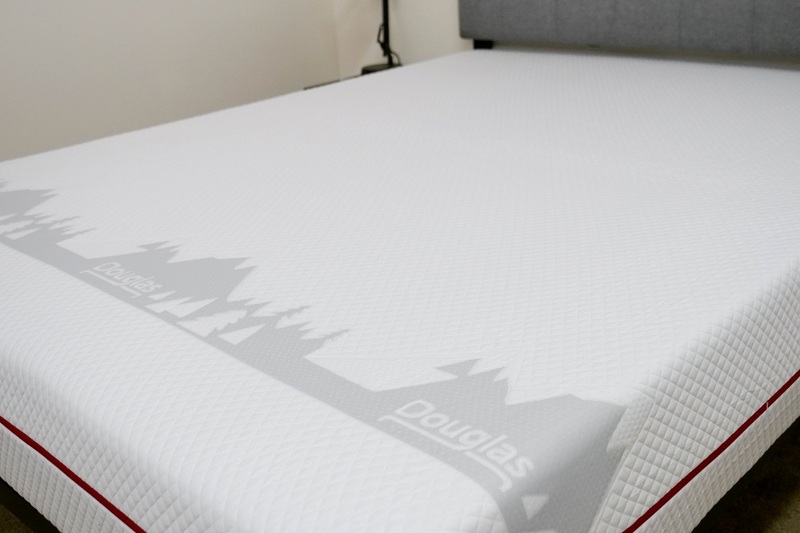 Canadians – Douglas prides itself on being a Canadian bed made for and by Canadians, so would make a great pick for anyone living in the country. Anyone in search of value – At C$799 for a Queen size, the Douglas is also a fantastic option for those looking for a high-quality mattress at a value price. 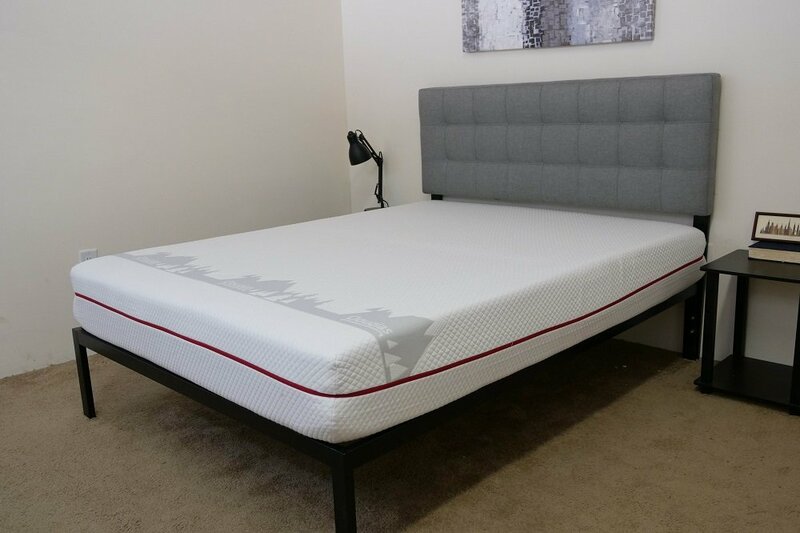 Want a soft foam feel – Featuring a balanced foam design, this mattress would be an excellent pick for those sleepers in search of a softer feel. While you’ll get some nice bounce from the bed, it’s overall a very gentle mattress. For more information on the Douglas, visit its website here! Get the latest deals, discounts, reviews, and giveaways! Logan is the content director of Sleepopolis, which means he not only reviews new mattresses every week, but also curates all the comparisons, best of pages, and video guides on the site. He takes a straightforward, honest approach to his reviews and endeavors to give viewers an objective look at each new product he tries out. Logan’s perfected his method over the course of personally testing over 100 different mattresses, so he’s not only able to discern the overall vibe of a specific bed, but to contextualize its feel within the bed-in-a-box market as a whole. Needless to say, his sleep knowledge runs deep, and he loves nothing more than sharing that knowledge with his readers. 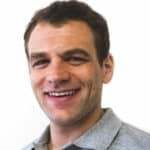 When he’s not hopping on a new bed or working with our editorial team to whip up an engaging sleep education guide, you can find him reading books on world history, walking his dog Pepper, or searching for the best cheeseburger in New York City. Do you want to Sleep Better? The Sleepopolis team is a group of sleep enthusiasts that will bring you the latest reviews, news, and analysis on all things sleep. Originally Sleepopolis started with mattress reviews, but we have big plans to expand going forward! We’re so grateful to you (our readers) for taking the time to appreciate our hard work, and we hope that we repay you by helping you best tackle the most important (and often least thought-about) 8 hours of the day. I’ve tested nearly every major brand on the market, here’s what I like! Are you looking to save some money on your new mattress? We can help! Use a Sleepopolis coupon code to save up to $250 on your purchase instantly. Hello, welcome to Sleepopolis! Founded in 2014, this site is dedicated to bringing you the most comprehensive sleep-industry information on the web. You’ll find everything from mattress reviews to sleep tips. We want to help you get the best night’s sleep ever! Head over to our About page to learn more about the team behind Sleepopolis. Copyright © 2019 Sleepopolis All Rights Reserved.